CarGurus has 13,384 nationwide Accent listings starting at $1,799. 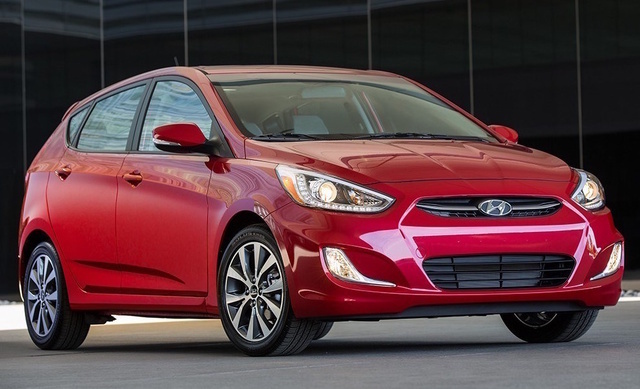 The Hyundai Accent has come a long way since its introduction in 1994. Redesigned in 2012, the Accent faces stiff competition from the likes of the Ford Fiesta, Nissan Versa, and Honda Fit, but it distinguishes itself with good value for the money; the 2017 Accent adds a Value Edition trim level that includes a number of features that were previously only available in more expensive option packages. Trims include the GL, L, and SE, and the Accent can be had as either a sedan or a 4-door hatchback. The 2017 Hyundai Accent will start in the $15,000 range, while loaded trims may not even crack $20,000. All versions of the Accent get the familiar 1.6-liter direct-injected 4-cylinder that makes 137 hp and 123 lb-ft of torque, making it one of the most potent cars in its class but certainly not one of the most potent cars on the road. Transmission choices are either a 6-speed manual or a 6-speed automatic with manual mode. The car will do 0-60 mph in about 10 seconds, which is slow by most standards, but the Accent is still quick enough to get out of its own way. The typical Hyundai Accent buyer isn’t concerned with such things as 0-60 anyway. Fuel economy is likely to be a more important number to him or her, and the Accent should at least satisfy. With an automatic, the car will manage 26 mpg city/37 highway/30 combined, while a manual-equipped Accent will do 27/38/31, which is not quite as good as the Honda Fit. Automatic-equipped cars feature an ActiveEco button that forces the transmission to shift up earlier than normal, while manual-equipped cars feature a shift light that comes on to suggest when the driver can save fuel by upshifting. Suspension is by twin-tube shocks up front with a stabilizer bar and torsion beam in the rear. Amazingly, for a car in 2016, the Accent still comes standard with drum brakes on the rear. Steering has been reported as being a bit soft for such a small car, but most drivers will probably find it just fine. Stepping up to the Accent Sport, though, does add a tighter suspension. Whereas Hyundais of old had an unmistakably cheap and chintzy feel to them on the inside, the current Accent has been praised for having impressive fit and finish considering its purchase price. There’s an impressive level of equipment for the money as well, with standard air conditioning, power windows, power heated mirrors, and a USB port. Opting for the hatchback adds a rear window defroster and a 17-watt audio system. Options bundled into the Popular Equipment Package include steering-wheel audio controls, a sliding armrest center console, and cruise control. The new Value Edition trim, meanwhile, comes bundled with Bluetooth, rear disc brakes, and 16-inch alloy wheels, in addition to everything included in the Popular Equipment Package. The Accent is also a lot roomier than its predecessor and is highly competitive in its class when it comes to storage. Any manner of items can be tucked away in places like the impressively large glove box or various bins and trays. One area where the 2017 Hyundai Accent falls a bit short is on the safety front. Even for a car so small and priced so low, it leaves quite a bit to be desired. Although it received 4 out of 5 stars in federal testing, its side-impact results in Insurance Institute of Highway Safety testing were less than stellar, and the IIHS also gave the Accent a Poor rating in the small frontal-overlap test, in which only the outer 25% of the vehicle's width strikes a barrier at 40 mph. In an automotive market where even cheaper cars seem to be bristling with high-tech safety features, the Accent also seems to be lacking considerably, with neither a rear-view camera nor blind-spot monitors. While it’s come a long way, the Accent still isn’t a standout, and there are no changes for 2017 significant enough to change that fact. The model is one of plenty of choices in the subcompact market, and its biggest strong point continues to be value for money rather than any standout features or style. What's your take on the 2017 Hyundai Accent? Users ranked 2017 Hyundai Accent against other cars which they drove/owned. Each ranking was based on 9 categories. Here is the summary of top rankings. Have you driven a 2017 Hyundai Accent? I have a Hyundai 2017 accent I just got it in August and the airbag light came on and it won’t go off today,what can I do to get it off?